There’s a scenic photo op around every corner in Boston. It’s a city of contrasts, one in which iconic historic sites, quaint cobblestone streets, ancient burying grounds and picturesque brownstones coexist with steel and glass skyscrapers, dramatic contemporary museums and broad avenues lined with glossy boutiques and trendy restaurants. Besides being picturesque, Boston is walk-able. Getting around the core of historic downtown is easy and interesting. 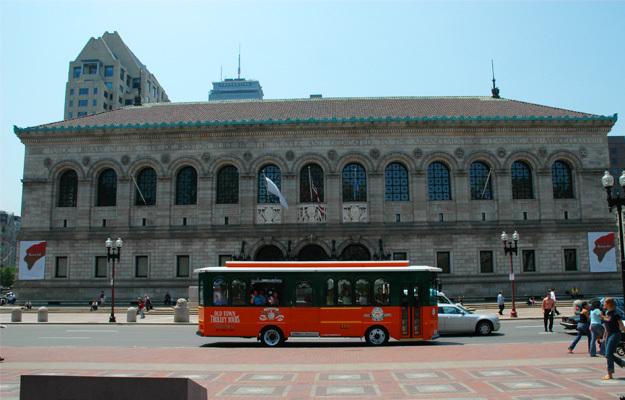 A great way to see it is on Freedom Trail’s Walk Through History Tour. 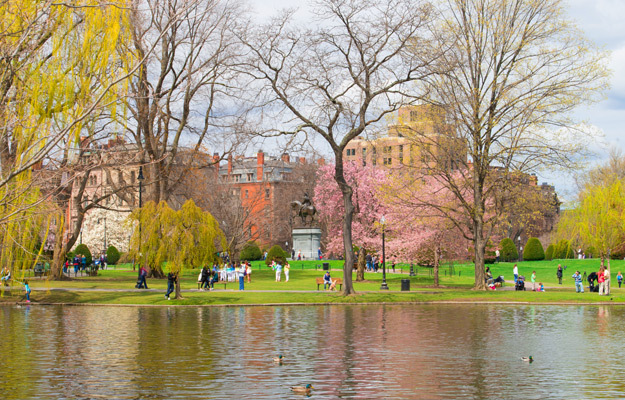 While the tour does not enter the historic sites it passes, it covers a lot of history and goes by all the important sites you came to Boston to see and photograph. To see historic downtown and beyond, the Old Town Trolley Tour is the way to go. Being able to hop off and back on again at any of the 19 stops along the route allows for up-close photo-ops. While both seats of government, past and present, are photogenic, the Old State House (1713), tucked in among the skyscrapers of the Financial District, is a treasure. As the center of civic, political and business life of the colony, it was the Seat of Royal Government and the meeting place of the Massachusetts Assembly and the Massachusetts Judicial Court. The stunning gold-domed State House (1798), which houses the Executive and Legislative branches of state government, has stood as a strong symbol of Massachusetts since the time of a fledgling America. The Old State House. Look up at the top of the front façade of the red brick, highly ornamented, symmetrical Georgian style building and you have your photo. Perched on the gables of each side are the gilded lion and unicorn, symbols of royal authority. Beneath them are bull’s eye windows. Centered below the clock is the ceremonial balcony from which the Declaration of Independence was first read on July 18, 1776. The State House. An image of the gold dome of the classic Federal-style building on Beacon Hill taken from the Boston Common below is the perfect shot! Languid and lyrical, Boston’s foot-pedal-powered Swan Boats quietly cruising around the willow-draped lagoon of the first public botanical garden in America (1837) are a favorite photo op. Swan Boats taken from the banks of the pond is a classic shot. Or, queue up for a quiet 15-minute glide around the lake aboard a Swan Boat to photograph the modern buildings bordering the Garden. Depending on the season, photos of colorful flowering plants and trees seen along meandering paths are lovely. Look for whimsical Make Way for Ducklings sculptures! It’s a fave. Many people of importance in America’s early history are buried beneath the gravestones in one of Boston’s three historic burying grounds. Photographing these ancient, tilting, moss-covered grave markers is a must. Two of the three burying grounds are close together: Granary Burying Ground, at the far end of Boston Common behind Park Street Church, is the 3rd oldest; King’s Chapel Burying Ground, the oldest, is a block away. Cops Hill Burying Ground is some distance away in the North End. Among those buried in Kings Chapel Burying Ground (1630), are some of Boston’s early prominent residents, including John Winthrop, its first governor, and Mary Chilton, the first woman to step off the Mayflower. In Granary Burying Ground, (1660), the graves of 3 signers of the Declaration of Independence: Samuel Adams, John Hancock, and Robert Treat Paine, are here. Peter Faneuil, benefactor of the famed downtown Boston landmark; Paul Revere, patriot and craftsman; James Otis, Revolutionary orator and lawyer; and five victims of the Boston Massacre are also buried here. Near the center of the burying ground, a 25-foot-tall obelisk commemorates the tomb of Benjamin Franklin’s parents. 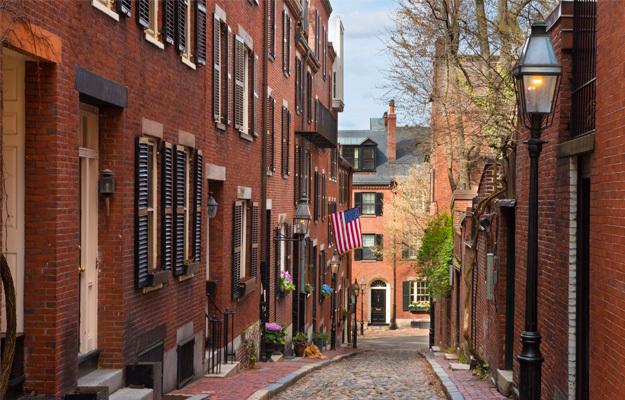 North End, Boston’s oldest community, is an immersion into a working-class neighborhood from the beginning of colonial America through its years as an Irish and Italian immigrant enclave. While it’s becoming gentrified, it retains its ancient look and Italian ambiance. Quaint, narrow, up-hill streets and alleys, made of “setts,” uneven granite stones cut into rectangles and cobbled together, lined with old brick building leaning in, are picturesque shots. Walk along Hanover Street, for a real sense of North End and turn off onto any alley or narrow street you come to. You’ll find your image. North Square is a great street shot. Look no further than North Square for a photo of the exterior of the Paul Revere House. Tucked in among “younger” buildings, the tiny gray wood Post-Medieval Paul Revere house (c. 1680) looks really old. Walk a few blocks up Hanover to Revere Square, the back side of the Old North Church Walk around to the front entrance to walk inside for great interior shots – the pulpit, the box pews and the organ pipes. Don’t’ miss the angels perched on the balcony rails in front of the organ pipes. Fabulous! Of course, a photo of the iconic white steeple is a must. Queen Anne style brownstones lining Newbury Street in Back Bay look old but not ancient. Built as prestigious, exclusive private residences in the mid to late 1800s, they now house upscale shops and boutiques, cafes and restaurants. Starting at the intersection of Arlington Street across from Public Garden, Newbury Street is a pretty walk, with a lot of architectural elements to photograph. In addition to rows of brownstones to photograph, there are some architecturally interesting churches. Newbury Street’s broad sidewalks, storefronts extending out into them, and and basement alcoves give it a unique feel. Two dominant historic landmarks anchor each end of well-known Copley Square in Back Bay – Trinity Church and Boston Public Library. The magnificent French Romanesque architecture of Trinity Church (1877), an active Episcopal Church, does not have a bad angle. A roughly textured facade of warm-toned stone and brick, deeply recessed arches, window groupings edged with bands of contrasting color, irregular roof lines and towers capped with conical roofs, make this Boston treasure a great photo op. The interior is striking too, with photo ops at every turn. Guided and self-guided tours during open hours are the way to see interior elements – stained glass windows, soaring space, and murals covering almost every wall. So beautiful, it’s become a backdrop for films. In contrast, Boston Public Library Main Branch (1888-1895), in grand Beaux Arts symmetrical style of highly finished gray granite, is all about controlled balance. Classical columns, a grand entrance, and high arched windows dwarf the human form. Two exterior photo musts: alongside the columns and with “Arts” and “Sciences,” the lion statues guarding the main entrance. The interior is absolutely magnificent. Vaulted ceilings, stone, marble and granite of all hues; allegorical figures in statues, murals and mosaics; galleries filled with magnificent art; and Bates Hall, the main library, a grand sanctuary for those who love books, all present countless photo ops. The Charles River, separating downtown Boston from Charlestown, Harvard and MIT, is a popular photo op. A walk along the Esplanade, a favorite summertime gathering spot, is the way to get river, park and Beacon Hill skyline shots. If you don’t want to walk it, it’s one of the many stops on City View Bike Tour’s 3-hour ride throughout Boston. Or, get a good view of the both sides of the river while cruising along the river on a seasonal Duck Tour, which can be purchased alone or as an Old Town Trolley/Duck Tour package. Charles River. A photo of sculling teams training on the Charles River is a true Boston image. They are out rain or shine, so the chance of catching them in action is good. Hatch Shell. Best known through national TV’s coverage of the Boston Pops 4thof July celebration held in the shell-shaped Art Deco outdoor bandstand, it’s another photogenic iconic Boston site. Arthur Fiedler’s Head is a favorite photo op! The huge sculpture along the river is one of many scattered throughout the 3 mile-long shady Esplanade. Click away at sweeping 360-degree views of Boston as far as the eye can see from the Observatory at the top of the Prudential Building. An audio tour helps orient you to what lies spread out below. Open from 10am until 8pm in winter and until 10pm in the summer, views are fabulous, day, sunset or nighttime. Numerous cruises depart from the wharves along Atlantic Avenue or the piers in the Seaport District for tours of the Inner and Outer Harbors. The most exciting is the trip out to the feeding grounds to spot migrating whales. Lunch, Sunset and Dinner Cruises are a great way to get out on Boston Harbor and see the skyline and some of the Harbor Islands. The result: wonderful skyline photos – and lighthouse shots. Check out Spirit of Boston Lunch Cruise, Boston Odyssey Lunch Cruise, Boston Harbor Sunset Dinner Cruise or Boston Odyssey Dinner Cruise. Limited on time? 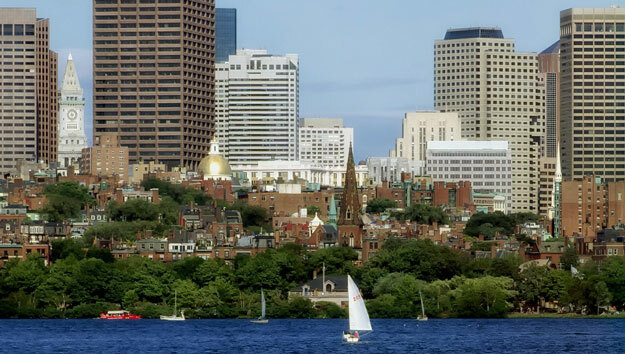 Try Boston Historic Sightseeing Cruise. It’s 90-minutes of great photo ops of Boston’s Inner and Outer Harbors, including Boston Light, the oldest continually operating lighthouse in the country. Whale Watching. One of the most dramatic once-in-a-lifetime photos is that of a surfacing whale. It’s majestic. Get that special image on a 3-hr New England Aquarium Whale Watching Cruise, a comfortable, fast ride out to Stellwagen Bank National Sanctuary, an active feeding ground for migratory whales. 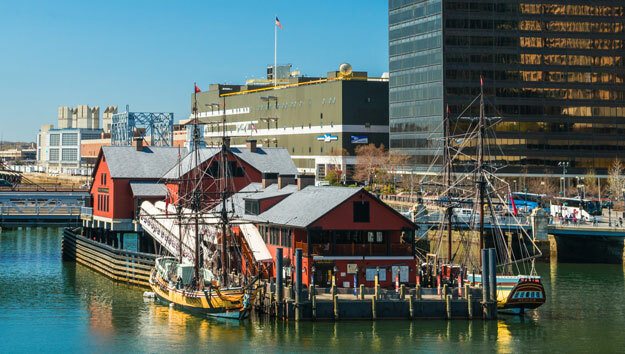 Boston’s exciting interactive museum which tells the story of the Boston Tea Party has multiple photo ops, from the land and from any one of the interesting locations on the floating museum. From the waterfront promenade. Start at the Intercontinental Hotel to walk along the Fort Point Channel waterfront promenade to get a great photo of the 90-foot replica historic sailing ships moored alongside the museum’s “Griffins Wharf.” It’s a cool shot. On a tour of the Boston Tea Party Ships & Museum. It’s not only fun, interactive and interesting, authentic-looking props and details and costumed actors provide numerous photo ops. Images from inside and on the decks of the sailing ships are great, so is a photo of throwing the tea into the sea! The tour ends in Abigail’s Tearoom on the top level, where floor to ceiling windows and a back deck provide panoramic views of the surrounding city.